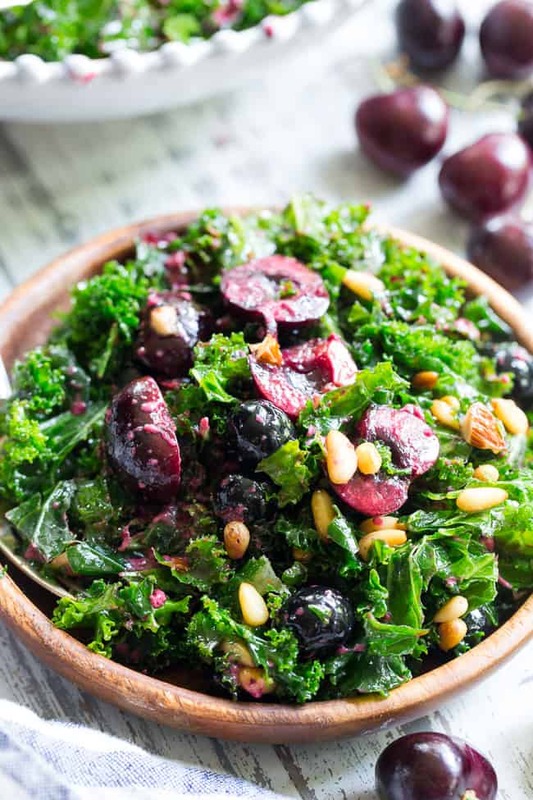 This paleo and vegan kale salad is packed with fresh cherries, blueberries, toasted pine nuts and almonds. It’s topped with a simple Whole30 compliant vinaigrette made with fresh berries and cherries too! Perfect as a side salad for summer or top it with your favorite protein for a full meal. See? I told you I’m obsessed with cherries. I’m putting them in everything from crisps to kale salads this week and I couldn’t be happier about it! 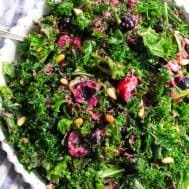 Spoiler alert – not only does this salad have fresh cherries tossed into it, but the vinaigrette itself is made with cherries and blueberries. I can’t think of a better way to use ALL the cherries I possibly can, given that I just can’t stop buying them whenever they’re around! 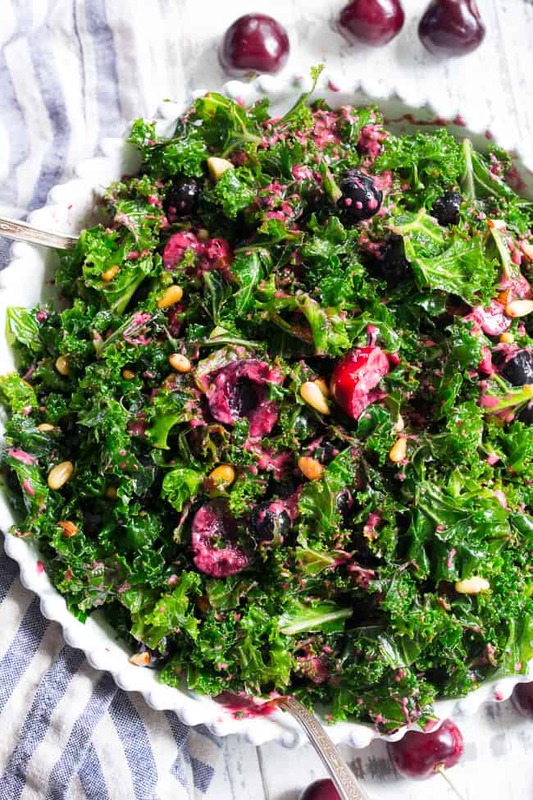 But let’s back up a moment – can you believe this is actually the first kale salad I’ve made? I can’t, given how much I love kale and consume it on a daily basis. I mean, sauteed kale IS seriously amazing and crispy kale is LIFE to me, so I guess I figured the fresh kale salad wouldn’t be able to live up to its cooked counterpart. And then, well, it got hot. I didn’t feel like standing in front of a hot stove, and I was curious! 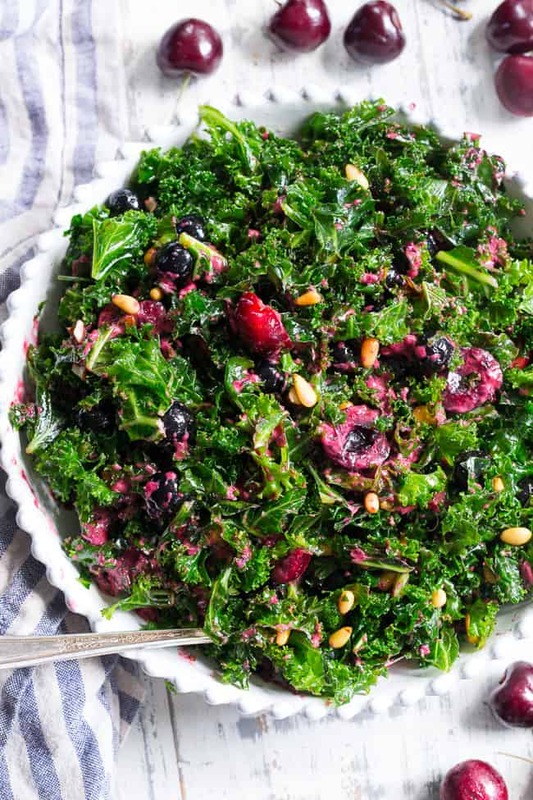 So, I decided to put my never-ending supply of cherries to good use and make this cherry berry kale salad. I’m so glad I did, because wow – kale salads really CAN be good! First, I knew I needed to massage the kale. Part of the reason I’ve never made a kale salad is that the idea of massaging kale sounded weird and slightly intimidating. But, this couldn’t be further from reality! 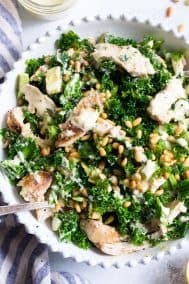 All you need to do is put your kale in a bowl (chopped), drizzle some olive oil over it and sprinkle with salt, and then literally just knead it in your hands for a couple of minutes. BOOM! That crunchy hard (and slightly bitter) kale is now soft and much more palatable thanks to the olive oil and salt. And, of course, it’s ready for toppings! I had lots of cherries, plus blueberries on hand, but you could also use strawberries here if you prefer. I decided to toast some pine nuts and chopped almonds since those were also in my fridge, and it gave the salad a delicious savory and “buttery” crunch plus some added healthy fats. Lastly, I knew the salad needed a really good vinaigrette, but I didn’t want to go garlicky or savory since it just didn’t seem fitting. I also didn’t want a “boring” vinaigrette since (let’s be honest) a kale salad could use some extra oomph from the dressing. So, I decided to blend up exactly what I used to top the salad – cherries and berries! I blended the fruit with lemon juice, some sea salt and olive oil until smooth and the result was delicious and of course simple. No need for honey or any added sweeteners here! Just fruit and lemon juice to add the perfect touch of sweet and tart, making the salad Paleo, vegan, and also Whole30 compliant. The vinaigrette complements the flavors in the salad, plus it’s such a pretty pink/purple color from the fruit! 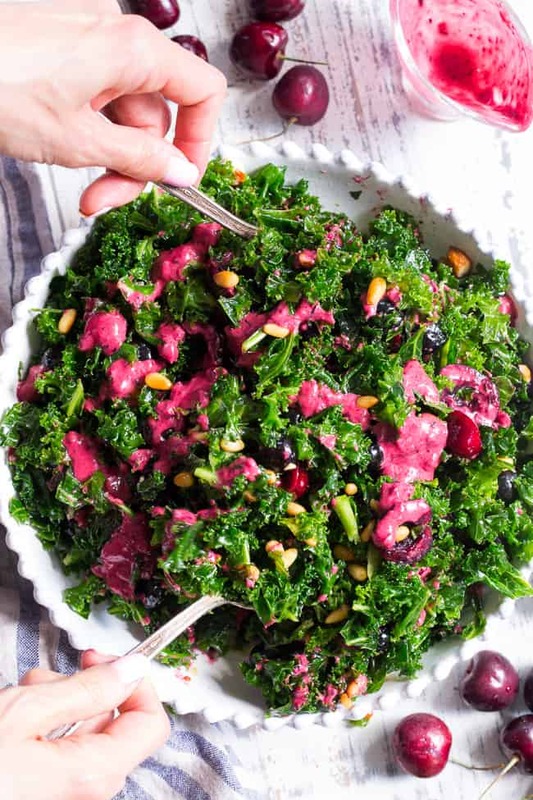 All in all, this cherry berry kale salad is awesome as a simple side salad OR you can easily make it a meal by adding in your favorite protein. I know you’re going to enjoy this one – grab those aprons (cherries stain!) and let’s get started! 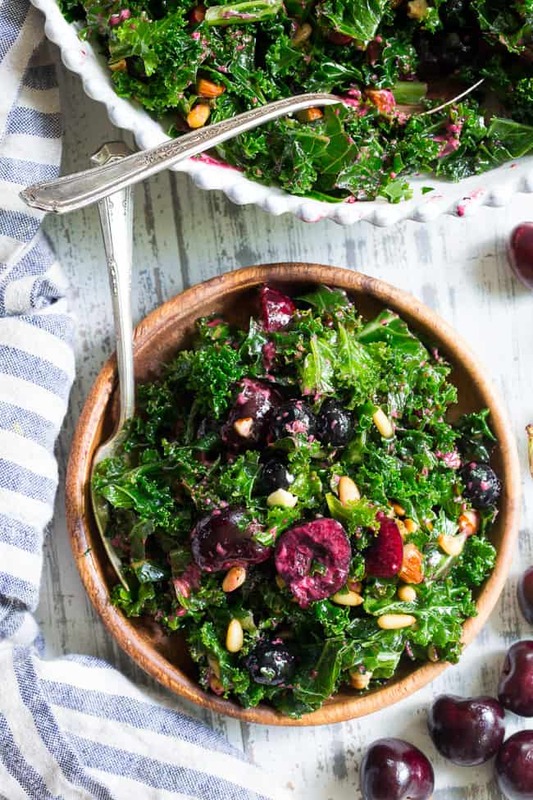 This paleo and vegan kale salad is packed with fresh cherries, blueberries, toasted pine nuts and almonds. 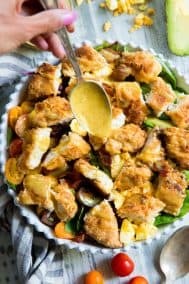 It's topped with a simple Whole30 compliant dressing made with fresh berries and cherries too! Perfect as a side salad for summer or top it with your favorite protein for a full meal. First, massage kale: Place kale in a large bowl and drizzle with the 1 1/2 tbsp olive oil, then sprinkle with the sea salt. Massage the oil and salt into the kale as if you were kneading bread for 2-4 minutes or until kale reaches desired texture. Heat a small skillet over medium heat with 1 tsp olive oil. Add pine nuts, sprinkle with sea salt and cook, stirring, about 2 minutes or until they begin to brown - remove from heat immediately to avoid burning and set aside to cool. Repeat the process for the chopped almonds, if desired. 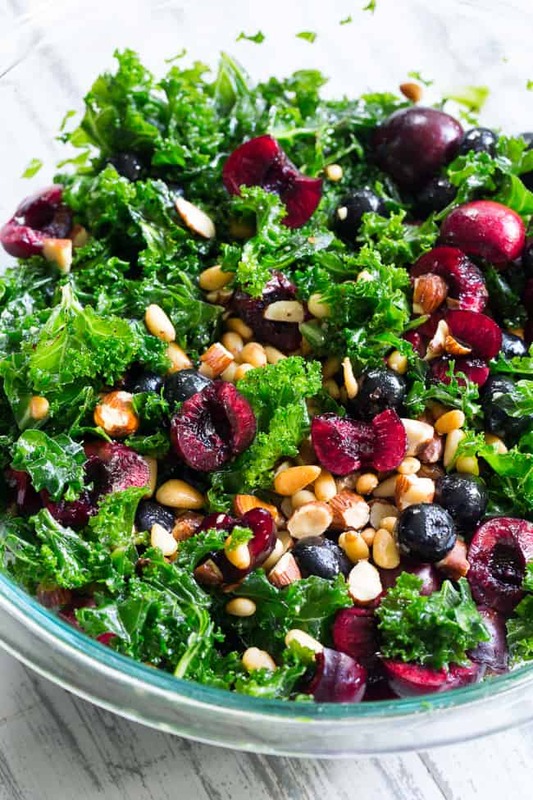 Toss the cherries, blueberries, and cooled nuts in with the kale, then drizzle with dressing and toss well to serve. Enjoy! Want more summer salad ideas? Try one of these! 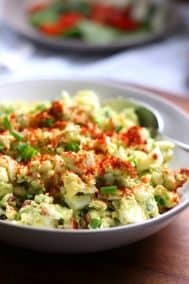 The other salads you have on this page , I wanted to check out but you can’t click on them and have them pop up. yummy looking salads! i wish i can eat those from the website. YUM! I love your recipes and this one was another hit! Really refreshing summer salad!